I know you’re getting impatient for us to reach Nigeria. Well, by the time you read this, we’ll have arrived. But right now we’re in the Frankfurt Airport, awaiting our connecting flight to Lagos. Was able to make the last blog post from here and, indeed, could have done it from the plane by purchasing an hour of wifi for about fifteen bucks. Pretty amazing, but it pales in comparison to making blog posts from a bus in rural Guizhou Province, China last November. That one still boggles my mind. Flight to Frankfurt was around seven hours (nine, with delays), a couple hours layover, then about six hours or so to Lagos. A long haul, but we’re used to it. And it’s a lot longer swim. Not surprisingly, the demographics on the plane change dramatically on the two legs, from almost all white, half German speaking, to almost all black, English speaking. We’re here. Airport in Lagos was quite a scene, starting with the customs guy asking us for phone numbers of our host. We gave him the name of the Lagos hotel and with a sly smile, he said, “Oh, you were invited by a hotel?” That wasn’t going to fly, but luckily we flagged down Funmi and Sola, who had already cleared the Nigerian line. We explained what was going on, Funmi grabbed an airport official and, with her in tow, marched over to the customs guy and had everything cleared up in two minutes. 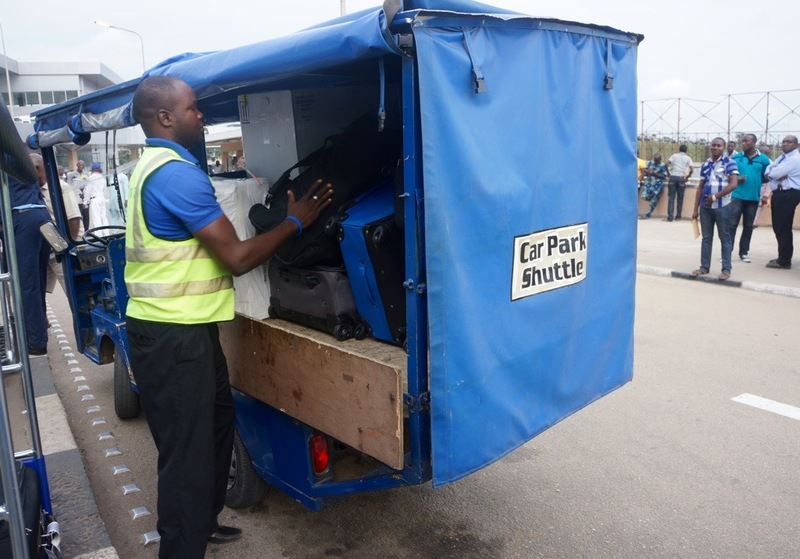 We went over to the baggage area, where Funmi and Sola retrieved the ten boxes they’d brought from the University of Chicago, essentially importing a small hospital. Airport officials inspected tags for everything, and Funmi let them know that she was an OON, Order of Niger, an honorific title bestowed on her a year or two ago, based on the nomination of the Governor of Ekiti State, with whom we’ll have dinner in a couple days. The honor is akin to OBE, or knighthood, in England. I told Funmi that I intend to coast through Nigeria, telling folks that I’m a FOON, Friend of an OON. We were met at the airport by people from Ibadan (where we will also visit), with whom the Olopades and U of C have a continuing relationship. We and our twenty bags were loaded onto and transported by stretch golf cart-like vehicles, that wove with great difficulty into the parking area, where two vans awaited us. The crowd at the airport was part in Western dress and part in colorful native garb. Our cart drivers had to get out periodically to physically stop traffic to allow us to wend our way into the lot. In the vans, we immersed ourselves in very heavy Lagos traffic. Our drivers tried various routes, finally getting us to the hotel in only about two hours. En route, we passed by the water slum areas with clouds of pollution hanging above them that almost abut the Victoria Island area, which houses the financial center of Lagos, and our hotel. 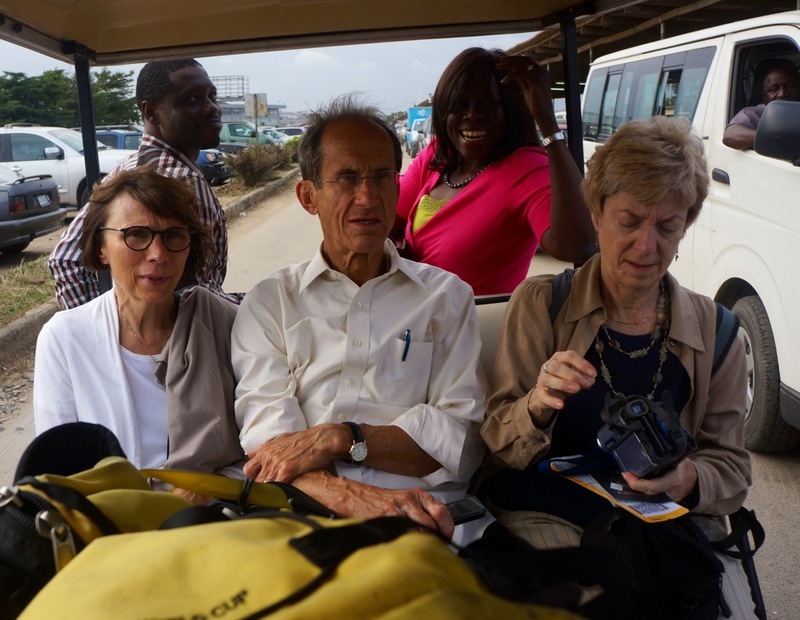 The two-hour ride was actually fine, though, as the air conditioned van provided a moving living room in which we all could learn more about Nigeria’s and the Olopades histories. Whenever we travel and hear or read about the histories of the places we visit, I am struck by how foreign our own experience is to that of the rest of the world. No foreign occupations, no colonial experience, no military juntas and rule. It makes it difficult for us to truly imagine the experiences of the places we visit. To give you the big picture on Nigeria, we were struck by how it bestrides sub-Saharan Africa as a kind of colossus. The population of Lagos alone is two-thirds the population of the entire country of Ghana. In a sense, Nigeria is three countries, the Ibo-dominated, oil rich Southeast (which seceded as Biafra in the late 1960s, resulting in a 30-month civil war that killed more than a million), the Yoruba West of the Country that includes Lagos, the country’s engine, and the Hausa North, which is largely Muslim, agrarian and military. These countries have different languages and cultures. There were originally twelve states in the three regions, but those twelve have now morphed into thirty-six, each with a government, and each (except Lagos) largely dependent on an oil-rich federal government for funds. Small wonder, then, that corruption is a big problem. Funmi and Sola are both Yorubas, and proud of it. Funmi’s father was an Anglican minister and Sola’s a businessman. Both Sola and Funmi were highly educated in the best and most competitive schools in Nigeria. They are both dual citizens, travelling on Nigerian passports on the way over, and US passports on the way back. It’s important for us to keep in mind that in dealing with Funmi and Sola, we are talking to the upper strata of Nigerian society and not to think that they are representative of the population as a whole. I’m sure I’ll fill in more about the Olopades as we go though Nigeria together. We arrived at the Blowfish Hotel, a very comfortable, though unpretentious place and were taken up to our rooms, passing through a courtyard area, with a very nice and large pool. We freshened up for 15 minutes, then met in the lobby for the short, one block walk to Yellow Chilli’s a popular local restaurant. There we sampled from a wide range of tasty Nigerian foods that Funmi and Sola ordered for our table. After dinner, we walked back to the Blowfish and sat at tables by the pool. There we were joined by about eight young 30-something Nigerians, friends and relatives of the Olopades very accomplished children. It was a very attractive, impressive and educated group of young business, financial and entertainment industry people, most of whom had lived in the US. Nobody would sell this group short, and if they’re the future of Nigeria, that future looks bright. After 45 minutes or so of lively discussion, comparing life in Nigeria with life in the US and elsewhere in Africa, we retired to our rooms, exhausted from our 36 hours of travel. Glad to hear you finally made it. A very long trip, not in the most comfortable accommodations. In addition to the striking differences between your experiences from the rest of the world, hope you’re also aware of another striking difference. Known for your cantankerous temperament, which comes dangerously close to bad manners when stressed, you morph into a forgiving and even gracious traveler, in these long suffering countries. So you impressively learn not just about but from the many different people you meet. Humbling experiences that you are able to integrate into your outlook and responses. A real learning experience. Look forward to the sights, sounds, people and thoughts you’re about to experience. And the wonderful ways you share the wisdom that emerges from them. The custom guy wouldn’t take Nana’s number? I think GAB’s comments above are right on the money. Would’ve loved to have listened in on the pool-side conversation/s. Sounds delightful and enlightening.